The beginning words of the U.S. Constitution are “We the People,” forever enshrining the principle of the Framers’ vision of limited government within the framework of a republican form of government, based not on the whim of a monarch, but on the consent of the governed. 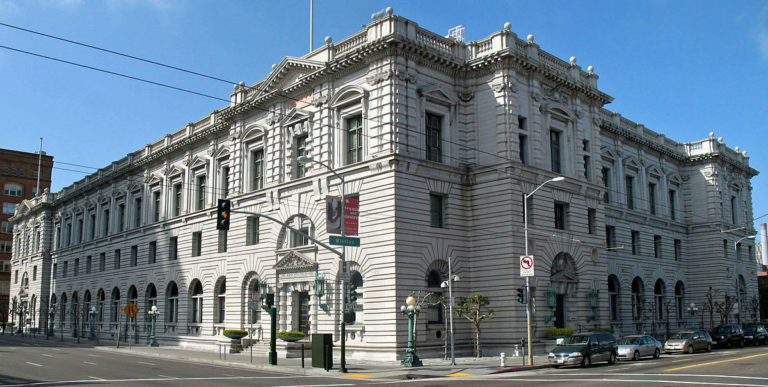 U.S. Court of Appeals in San Francisco, CA. Today, the question arises as to whether the United States of America is a nation of laws enacted by the people’s duly-elected representatives or a nation lorded over by a black-robed ruling class that enacts laws by judicial fiat? Did “We the People” ever hold a national referendum on banning prayer from the public schools? Did “We the People” ever vote on legalizing abortion on demand? Did “We the People” ever cede to the federal courts the right to define marriage? Of course not. Yet, these are only three of the many examples that could be cited regarding the modern judicial dictatorship that rules our lives today. In each case, the Supreme Court arrogated to itself the role of our elected representatives and decided what the law of the land should be. No popular vote was held, no election took place. Instead, a simple majority of nine unelected lawyers was allowed to make law and the public will be damned. Is this the “Democracy” our liberal and progressive friends talk about protecting from Donald Trump and his Russian election saboteurs? The progressives shout “Democracy, Democracy,” yet there is nothing democratic in a system of government by politicians in black robes elected by no one and empowered with life tenure. The issue of judicial supremacy takes on new relevance today as President Trump— acting in his Constitutional role of Commander-in-Chief — moves toward declaring a national emergency to stop the invasion of our southern border by foreign migrants, vicious criminal gang members, seedy human traffickers, and massive quantities of deadly drugs. Even before he takes such an action, political analysts are predicting that Democrats will go “judge-shopping” on the leftist Ninth Circus Court of Appeals and find a judge who will immediately strike down the President’s action. Yes, “Democracy, Democracy!” If we don’t like the decision of a duly-elected President ( the only elected official voted in by all Americans ), we just find one federal judge somewhere, anywhere, to issue an injunction to stop him. This is madness. This is the exact opposite of the Constitutional self-government bestowed upon us by the Founders. This is tyranny, pure and simple. Yet, it is the preferred system of government of our liberal and progressive friends who have always seen themselves as an intellectual elite who know best and who “We the People” better mind, if we know what’s good for us! That’s why the Left in this country has been misusing the federal courts for more than a half-century, treating it as a super-legislature to enact by judicial fiat what “We the People” refused to vote for. We in California know better than anyone that the federal courts exist to thwart the will of the voters. Whether Proposition 187 in 1994 or Proposition 8 in 2008, the voters can choose to enact their policy preferences at the ballot box, only to see a liberal federal judge immediately nullify their vote. Yet, this is “Democracy,” according to the Left. Their Orwellian manipulation of language reminds us of the many Communist terror states in the last century that called themselves “People’s” and “Democratic” republics. Likewise, so too did Presidents Andrew Jackson, Abraham Lincoln, and Franklin D. Roosevelt distrust the federal judiciary. Each of these Presidents either defied or was fully prepared to defy a decision of the Supreme Court if it conflicted with the greater good of the country that they were elected to protect and defend. As recently as 1971, President Nixon was determined to proceed with the Amchitka nuclear test regardless of whether the High Court ordered him not to go forward, as he believed the test was essential for our national security. President Trump must be prepared to do the same, if necessary to protect our nation’s borders and sovereignty. For if great Presidents like Jefferson, Jackson, and Lincoln were prepared to confront the highest court in the land, how much more justified would President Trump be in defying a lowly politically-appointed federal appeals court judge who is arrogant enough to believe he or she should be making the laws for 300 million people? After all, is our system not based on three co-equal branches of government or as George Orwell might put it, are “some more equal than others”? Mr. President, if Feb. 15 arrives and no agreement on border security is in place, declare a national emergency and if a cherry-picked judge of the Left strikes you down, please strike him down, on behalf of “We the People” who demand an end to the rule of black-robed despots.